My friend Alexa is the best at picking out awesome restaurants–I owe a lot of the food on this blog to her fabulous finds. For her birthday, a group of us went to Bond, in the Langham Hotel. If you’re ever looking for a place with a elegant, “loungy” vibe, check this place out. 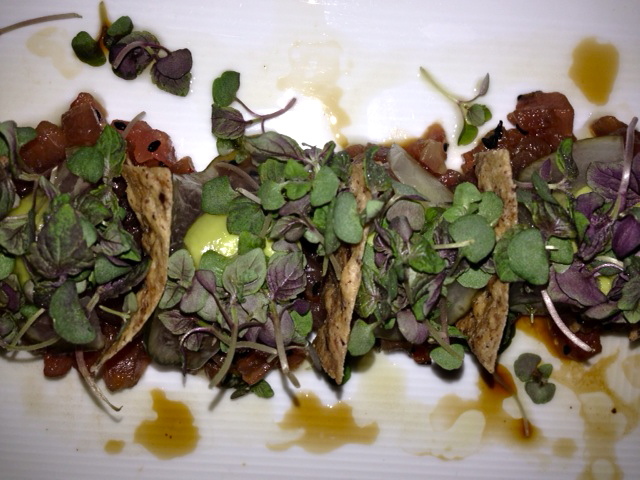 The lounge setting fits its menu–smaller dishes for a sophisticated palate. My friend and I split this incredibly fresh tuna tartar, a crispy sweet chili and black sesame glazed calamari, and a bread basket that was simply divine–it was served with this Maine butter topped with sea salt–talk about mouthwatering. The flavors that these foods combine could not work more perfectly. 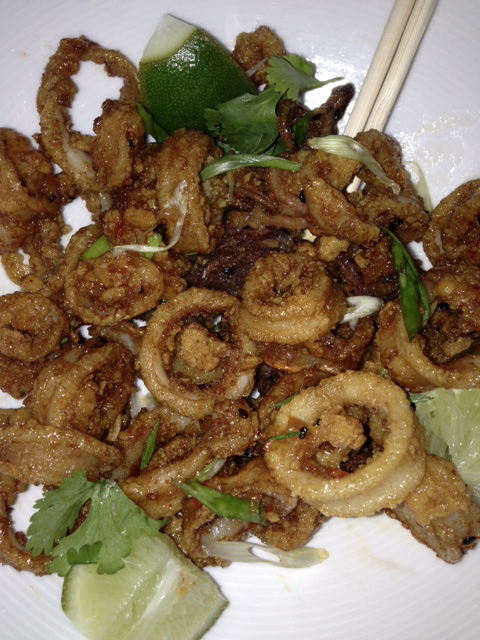 And one of my favorite things was that they served their calamari with chopsticks–how cool! We managed to eat everything without taking a breath. I wanted to order EVERY SINGLE THING on the menu (but that would have left me flat broke.) Other menu items included an artisan cheeseboard, smoked pork arancini, spicy lamb meatballs, a BBQ duck flatbread (it was hard to refrain myself from ordering this since all I need to see is the word BBQ and I’m sold), thai basil spring rolls, angus sliders and so much more–sorry for practically naming half the menu, I seem to be hungry as I’m writing this. The hotel is easily accessible and the vibe of the restaurant gives you a reason to dress up (and I’m always looking for an excuse to throw a statement necklace and heels on!) If you’re looking for a great place to go with a group of girlfriends or just want a drink and appetizer after work, Bond is a fabulous place for just that. But until next time, keep eating!